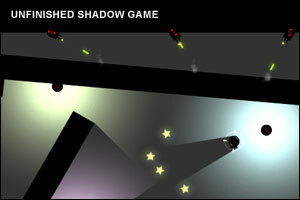 Unfinished Shadow Game is a simple, easy but unfortunately “unfinished” 8-level game from Wayne Marsh where your goal is to collect stars in each room to open new rooms. You don’t have to collect every star in a level and you can always come back to level via the map screen. The defense systems are light activated. If you stay out of the light, nothing will see you, but if you enter the light you will trigger the automated weaponary! Unfinished Shadow Game video walkthrough! Graet game, if only a little too short for my liking! Nice game and all, except for the fact that it’s like IMPOSSIBLE to get the bottom left star in level five…. In fact, it’s pretty easy: just push the lightning box to the far left, grab the star and leave! It took me a bit to figure it out, but I found another way to get the bottom left one. The exit has light coming through, so go in the light of the exit. You are safe, but scoot down enough so that when the bottom left gun tries to shoot you, it hits the lightning instead. Keep doing this until its over that little ramp and you can pass safely if you go quickly. Thank you Anna, that tip helped me. I beat this rather quickly. On the one level with the blue light box on the bottom, you can get the turrets to shoot it up and over the hill. Then use one of the boxes from above to keep your little guy from appearing in the light to shove the light box over into the corner toward the path to the exit. After that, go pick up the last elusive star and head for the exit. I mean level eight please sorry. how do you get the last star behind the red beam in level 8? There is no switch for the laser, because there is no need. If you push the yellow light box at the top to the right, near the laser, you can see the laser doesn’t block the passage enitirely, and that you can go underneath the laser, and get the star. Simply get all four stars and head for the exit. Wait for the light bot to mess the level up and kill itself before doing anything. Then, collect the 3 available stars, push the box over the switch to deactivate the laser, collect the other 3 stars and exit. This room is a demonstration of what happens if you go into the light while there are laser guns around. However, as they cannot harm you, pick up all 4 stars and leave. When the light bots are at the bottom, grab the star nearest to you and the star in the middle, taking care to stay out of the light at all times. When the light bots separate, dart in between them and grab the star in the bottom right corner, then follow the light bot going up to the top of the level, while keeping a safe distance behind it. When you get the star at the top, go down, through the gap, and wait til you can get the star at the bottom left safely before exiting safely. Grab the star at the top right, then go down and left where the star by all the boxes are. The aim is to push over all the boxes so they cover the light box, making it possible to get that star. Then, ignore the star at the bottom left for now (there is method in my madness, trust me!) and grab the star near the exit, but enter the light near the exit to set off the lasers. What you want to do is position yourself in such a way that the laser in the bottom left shoots the light box over the ramp, making it safe to grab the star there. Then, head for the exit. If you can, grab 3 stars quickly before hiding in the top right away from the bot. Once the light bot starts to move away from you, follow it at a safe distance before cutting in front of it through the gap in the wall. Grab the star at the exit and exit. Get your inverted alter ego that is imprisoned at the left to push the light box so it goes on the switch. Then, maneouvre your normal self to the green laser, and as soon as the light bot pushes the switch, go past. Grab all 4 stars before waiting for the light bot to push the switch again, allowing you to go past the laser again. Then, go down then right in such a way so that your alter ego pushed the red switch while you go all the way to the exit. Really easy, this level. Push all the light boxes around so you can see where you are going. When you get to the laser, go underneath it and get the star there. Once you get all the stars, head for the exit, and for freedom! Posted on Tuesday, April 13th, 2010. Follow any responses through the RSS 2.0 feed.